Psycho Pass is a cyberpunk police story in the same vein as Ghost in the Shell. But instead of being centered on the theme of cybernetics, Psycho Pass explores the concept of a society where your mental health is constantly scanned as a matter of public safety. Those with even the slightest case of mental instability are captured and locked away, long before they commit any actual crimes. After its first half, Psycho Pass looked to be the most thought-provoking anime this season. But while it sadly didn't quite live up to its potential in its second half, Psycho Pass is still worth a watch. The second half of Psycho Pass really raises the stakes. Instead of facing off against a series of "normal" serial killers, the police are battling threats that aim to destroy the very society they live in. As the main villain of the series, Makishima's final two plans are adequately epic and show that when he moves from just helping other criminals to stepping to the forefront on his own terms, he is in a league of his own. The other killers we see in the series simply want to end people's lives. Makishima, on the other hand, wants to destroy everyone's very way of life. So while the villain remains one of the best in recent memory, a good villain is nothing without a hero capable of challenging him. Kogami is the one set up by the plot to be the villain's rival; yet he is a static, one-note character and thus is not very interesting. The female lead, Akane, on the other hand, develops into the series' star character in the second half. In the first half, Akane was simply the viewer proxy character—the character whose job it is to ask all the "dumb questions" the audience wants to ask to understand the plot and setting. But in the second half, she steps out of this role to become a strong and unique character in her own right. How she reacts and grows based on the dilemmas she encounters are the most interesting aspect of the series—especially right near the end when she nears her breaking point. the main cast, I have only seen three characters' backstories. Three of seven. While I have heard exposition regarding the other characters, hearing a person's story and seeing it are two totally different things. (You know, "show not tell" and all that). Thus when main characters start dropping, I have a hard time caring all that much. After all, without seeing their backstories, it is hard to connect with and care about them. Mixed — Who am I supposed to be rooting for? people. The anarchist is an evil mass murderer, but only he can bring down the system. Our "heroes" are innocents in this little war (though they technically work for the system); but anything they do will result in a miscarriage of justice. By the end of the show, one main character is bent on revenge-murder, while the other is out to enslave a man for personal gain. So when everyone is doing wrong for selfish reasons, who am I supposed to root for? You probably learned about basic plot-driven story structure in grade school: beginning, rising action, climax, and falling action. Some stories, specifically TV series, have multiple climaxes at the end of each episode and/or at the end of each story arc—with each one being bigger and more explosive than the last. However, it typically stands true that the final climax is the biggest—either on an emotional or real world scale. The problem with Psycho Pass is that the biggest climax—the one with riots in the street, society tearing itself apart, robotic overlords, rivals confronting each other (and dogs and cats living together)—is the end of the second to last story arc instead of the last one. Moreover, every one of the series' major mysteries is exposed here as well. Thus this mystery show runs out of mystery a good six episodes before the ending. Psycho Pass has a lot going for it: an interesting premise, well-made world, an interesting main character, and an amazing villain. Sadly though, it doesn't quite live up to its promise. The structure of the second half and the inescapable moral conflict serve to undercut the overall narrative. Moreover, a few more episodes spent on the other characters would have served the plot greatly as well. But despite its issues, Psycho Pass is still very much worth watching. 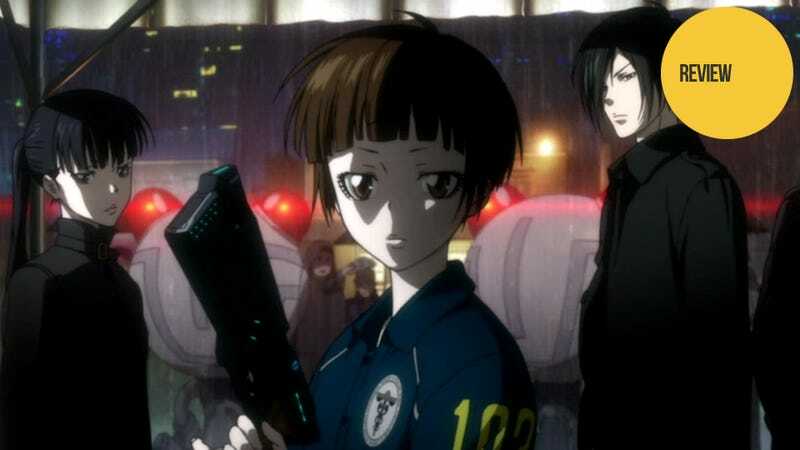 If you like cyber punk, Ghost in the Shell, or detective stories, you should give Psycho Pass a try. Psycho Pass finished airing on Fuji TV in Japan last night. It can be watched in the U.S., subtitled in English, at Funimation.com.